A&J Motorcycle Safety School offers the two day motorcycle safety training course, the Basic Rider Course (BRC) . 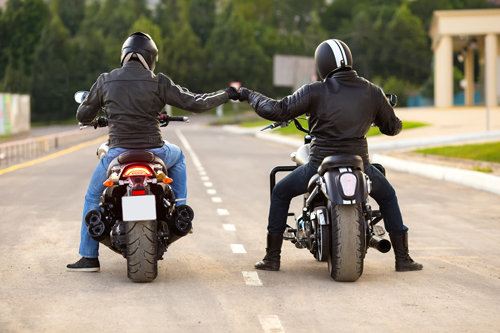 This course is our most popular and will help you earn a road test waiver to obtain the motorcycle endorsement on your driver’s license. We also offer the BRC 2 (formerly the ERC-Experienced Rider Course) and private classes are an option for a group of your friends or colleagues for any of the courses we teach. Don’t forget to ask about our Women’s Only classes and new this year, a motorcycle maintenance class. We’re veteran owned and have been in business since 2007. We’ve provided training to close to 4000 people from Fort Kent, to Kittery and Jackman to Calais. We operate the largest privately owned training range in the State. So what does that mean for you? It means we can offer classes six days a week which gives you options, flexibility and a chance to get in quickly. Learning to ride is serious fun and we provide a relaxed and safe environment. We use the Motorcycle Safety Foundation (MSF) Rider Education curriculum which is internationally recognized. To take one of our classes you must call in advance to register at 207-469-0051. All of our classes have a State required minimum of four (4) students and a maximum of twelve (12) students. If the minimum is not met you will be scheduled in the next available class that works the best for you. Classes fill up quickly so please call as soon as possible. Check out the overview of classes and find the one that works for you. We look forward to seeing you on the training range! Basic Rider Course (BRC) – This hands on course is for new or returning riders who want to get their license and learn to ride safely. We’ll teach you practical skills and techniques like; slow speed maneuvers, clutch control, cornering, avoiding obstacles and stopping quickly. These are lifesaving skills. This course consists of an online class through Motorcycle Safety Foundation which takes approximately three hours with a test at the end, the completion of the online course is mandatory with the completion certificate being required on the first day of the course. You will then attend an interactive portion of classroom at our facility for approximately five hours along with riding 14 different exercises on the motorcycle for approximately 10 hours. We provide the training bikes and you just bring some basic safety gear. By passing the riding exercise evaluations and written test for the BRC at our range you will leave with a ‘Course Completion Card’ which will waiver you for the road test and written test at DMV. Just head to your local DMV where they will stamp your license with the motorcycle endorsement and you are licensed to ride! 3 Wheel BRC – This class is the best place for a new rider to start once they’ve made the decision to ride a 3-wheel motorcycle. Three wheel bikes handle very differently from their two wheel counterparts. This course includes four hours of classroom activities and up to eight hours of on-cycle riding exercises. Successful completion may lead to an insurance discount. A person must pass a knowledge and skill test for successful completion. Upon successful completion you’ll receive a course completion card that you’ll take to the DMV so they can add the motorcycle endorsement. Basic Rider Course 2 (BRC 2) – This course is for the licensed rider and the training is a hands on class completed on your motorcycle. The course will help sharpen your skills. You will learn to improve handling and promote good riding habits as well as learning some new techniques. It’s highly recommended that you have ridden at least 2,000 miles on the bike you are bringing to the course. The course is between 6-8 hours and is held the last Wednesday of each month.